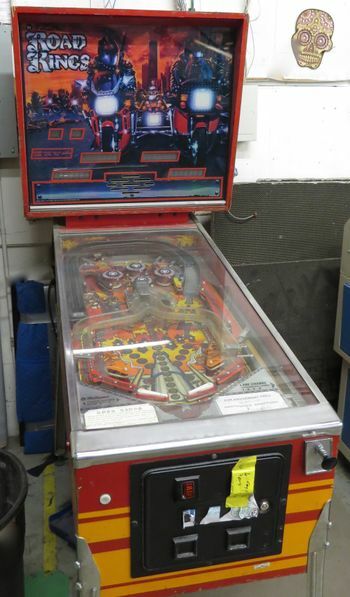 The pinball machine, showing its location to the left of the large laser cutter. The laser cutter's honeycombs and a laser-cut skull are visible in the background. Manual is available as a PDF online and on paper inside the machine. This is the cause of the left flipper sticking on the down-stroke, and the repeated blowing of at least one fuse. They keep getting out of alignment no matter how much they are tightened. Maybe threadlocker would help? Ian did one in Feb 2016. Rutger wants to do this pretty much immediately (as of Feb 2016). Frollard is not so optimistic, because the existing matrix depends on the incandescent bulbs' resistance, making LED replacement complicated and likely not at all power-saving. This page was last modified on 30 January 2019, at 21:08.